Salvator Fabris was born in 1544 in or around Padua, Italy. It is not known with whom he studied, however he grew up during a time of considerable growth in Italian Swordsmanship with the likes of Achille Marozzo, Angelo Viggiani, and Giacomo di Grassi teaching throughout Northern Italy and Europe. 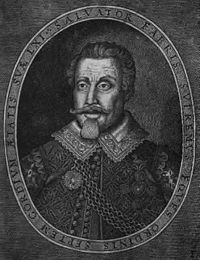 Fabris himself taught throughout Europe and most notably in Denmark first in the employ of Duke Johan Frederik of Schleswig-Holstein-Gottorp, Archibishop of Bremen in the 1590s and later his cousin King Christian IV of Denmark from 1601 to 1606. It was during his time as the fencing instructor to the King of Denmark that Fabris published his manual De lo Schermo, overo Scienza d'Arme in 1606, with the king's patronage and use of the royal painter Jan Halbeeck. Lo Schermo was a bestseller throughout Europe published in 10 separate editions, including several German translations and a recent 2005 translation into English. After his employment in Denmark concluded, Fabris returned to Italy to take up a teaching post at the University of Padua. He died in 1618 of malignant fever at age 74. The Wikipedia Article on Salvator Fabris. ↑ In 1686, Francesco Antonio Marcelli states in his Regole della Scherma, p. 12: Salvador Fabris [...] was teacher to the King of Denmark. ↑ City of Padua, Archivi della Sanita', entry on Fabris' death. This page was last modified on 13 September 2007, at 16:32.